First of all, my hat goes off to all of you mamas out there who are making pumping work for you! It's neither easy nor fun and it takes huge commitment so coming from a mom who HATED pumping, keep up the good work- every bit counts! But, in case you missed it, there are new CDC Guidelines for Breast Pump Cleaning. Gone are the days of rinsing pump parts and tossing them in the fridge till next time. After an investigation into a case where a baby contracted a rare but serious Cronobacter infection, the CDC responded to a lack of evidence-based information on keeping your breast pump clean by releasing their own set of guidelines. 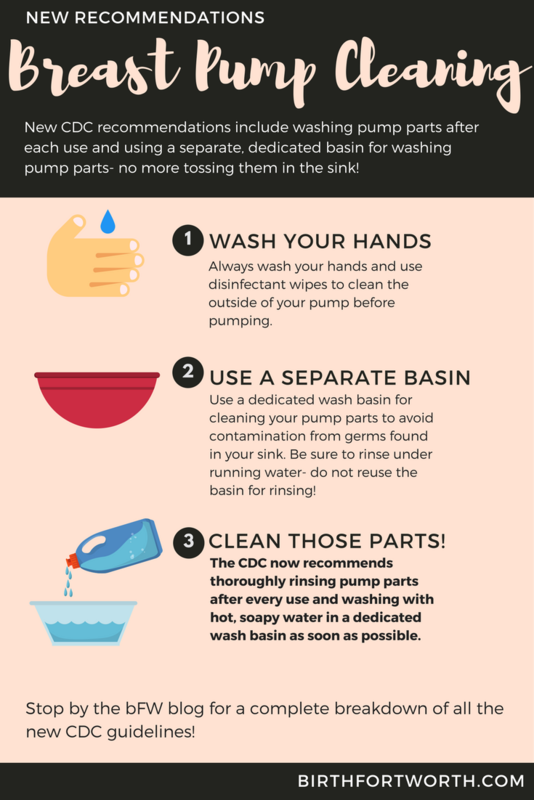 Wash your hands before handling your pump and be sure to wipe down all external pump surfaces with a disinfectant wipe. Rinse your pump parts immediately after use and wash in a dedicated basin with warm, soapy water as soon as possible. Don't put them in the sink! Allow all pump parts, bottle brushes and wash basin to thoroughly air dry between uses and before storage. Avoid using a dish towel for drying as this may transfer germs to the items. Store in a clean, protected area to prevent contamination between uses. If using the dishwasher, run the dishwasher using hot water and a heated drying cycle (or sanitizing setting) as this can help kill more germs. Wash hands before removing and storing items and remember, if they aren't completely dry, allow items to fully air-dry before storage. Avoid towel drying to prevent contamination.